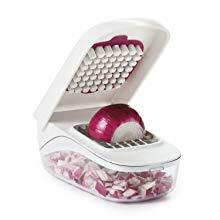 Quickly and safely chop onions, peppers, and more in one easy motion, and easily pour chopped fruits or veggies without removing the lid. 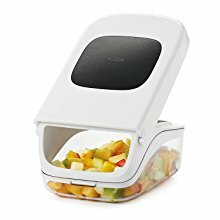 The stainless steel blade pattern and recessed cutting area keeps food in place while the lid provides leverage for efficient chopping. 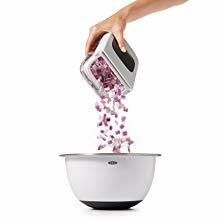 The 600ml capacity body collects the chopped food and the non-slip base provides stability while chopping. 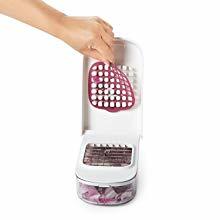 Removable grid helps clean between Chopper blades and snaps back into place after removal for easy on-board storage.